July was the biggest month of the year so far for us, perhaps it will be all year, and so my biggest blog post too! It started with the excitement that I had qualified to ride in my first International Competition representing Great Britain! I knew we had achieved the qualifying scores, but it was still amazing to receive confirmation at last, particularly as I had originally been left off the email list by British Dressage and so got it a few days after everyone else knew! 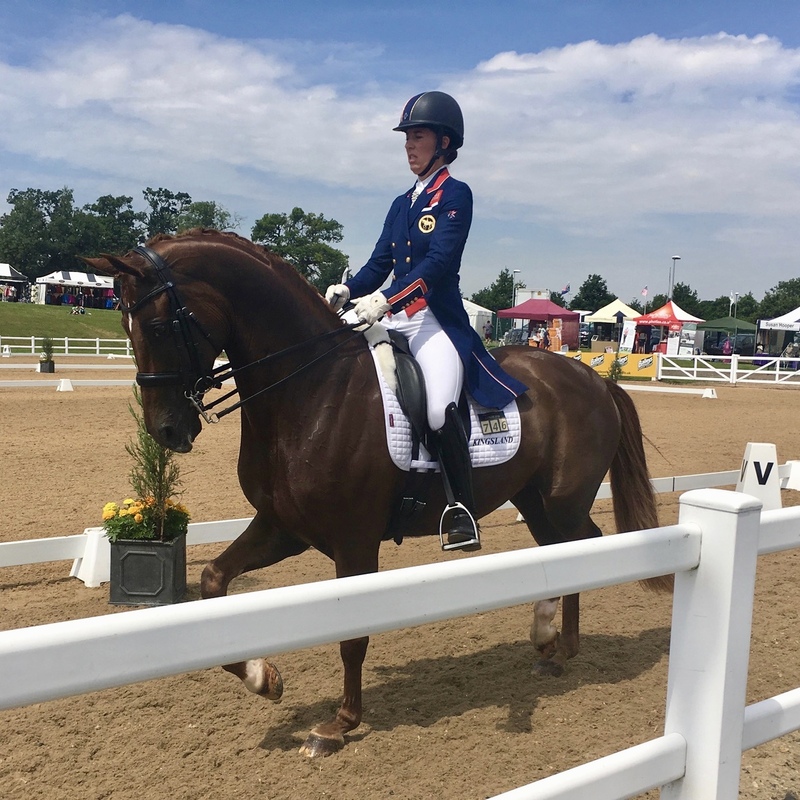 It was a very big deal for me as it was the first time I got to ride an FEI CPEDI 2* competition and the very first time representing Great Britain in an International competition! Just receiving the Union Flag badges to sew onto my riding jacket and saddlecloths was exciting enough! Competing at 2* means I ride the FEI Novice A and Team Tests and a Freestyle test too (if we qualify), so practicing my Novice and Team tests and preparing my Freestyle was the focus of training this month. I hadn’t ridden Freestyle before in a British Dressage competition so it was pretty exciting to have the chance and I was lucky to have some great help from Sarah and Angie on the yard who have plenty of experience preparing and riding freestyle tests all the way to National level. I borrowed some awesome music from Sarah, who also adjusted one of her floor patterns for me to try out and even rode Aslan through it for me. After just a few sessions Aslan and I were getting the knack of it and the timing right with Sacha helping us iron out some of the wrinkles in our compulsory movements. We got to include changes in a test for the first time and also added in leg yield for the first time, which is a bit tricky on my right side but we got there! Not perfect perhaps, and plenty to work on over the winter for next season, but a good start to riding to music and really really great fun. I think Aslan likes it too! Here is one of our first practices ever of a freestyle test. by next year. I was originally classified for the Riding for the Disabled National Championships as a grade 3 rider, which is now grade 4, but had to be classified under the FEI system to ride in International competitions. I am glad to say that the FEI classifiers agreed with my original classification and there was no change and I stay as a grade 4. This means that the I will continue to ride the same tests I have been riding this year, though some of my competitors have been down graded so there will be new riders in my classes going forward. Although I was at Hartpury for classification I also managed to to a bit of spectating and the absolute highlight was watching Carl Hester coach Charlotte Dujardin during her warm up and see her trot right by me. Classification was only the half of it as I also have to apply for compensation aids to be approved. I ride with velcro slippers which attach to my stirrups and I also use Equilibrium Products Symmetry Straps between girth and stirrup. My hemiplegia means I have limited control and not much feeling on my right side and these compensation aids are essential to prevent my foot coming out of the stirrup without me realising it, which would not be safe, or from going to far back and really confusing Aslan. We didn’t realise it until afterwards, but the compensation aids get approved by a different committee to classification and so we had to send the application off via British Dressage. It was pretty stressful waiting to hear if my aids were to be approved as the compensation panel stated they needed 2 weeks to decide on the aids. I have to thank Rachel Smith from BD who chased the FEI panel on our behalf every day leading up to the start of the competition and we literally received confirmation a couple of hours ahead of my first test at Bishop Burton which was a huge relief, as I wasn’t sure that I would be able to ride without them. Getting ready for Bishop Burton was a lesson in itself as there we lots of new things to consider including getting our music registered to ride the Freestyle which I hadn’t had to do before. A week after Hartpury I was invited to a reception organised by SportsAid at the Royal Bank of Canada in the City of London. I am one of fifty athletes sponsored by RBC in 2017 and they were raising sponsorship funds by entering a team into the RideLondon cycling challenge. I was there to explain how important their sponsorship and support is to me and their other athletes. 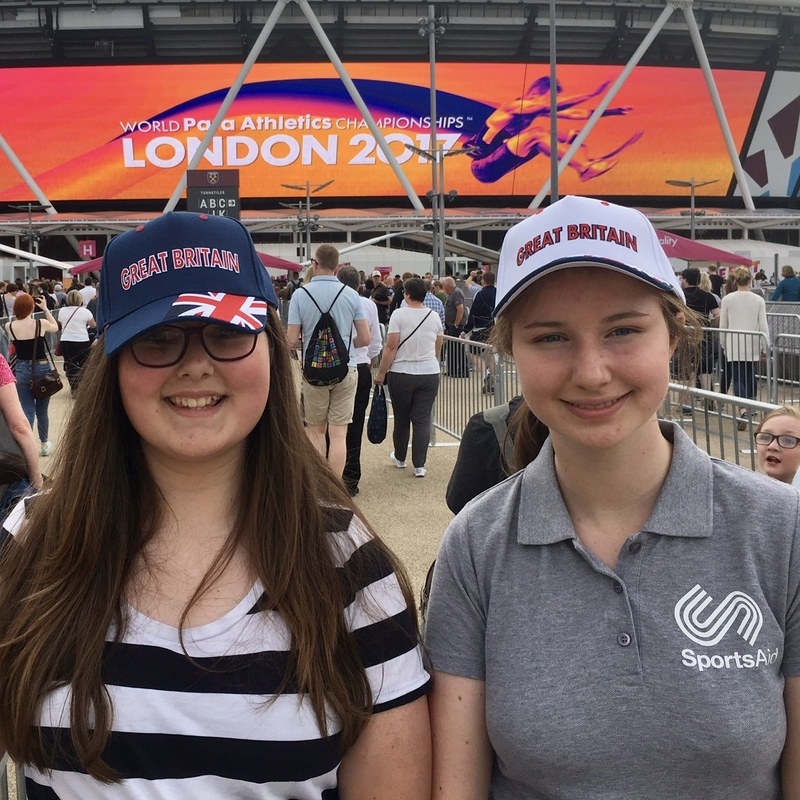 As usual with SportsAid events, it was a bit daunting as I new I would be participating in a live question and answer session in front of everyone along with para-cyclist Drew Walker and cyclist Louis Billyard. As daunting as it is, it’s really great experience for me and one of the definite benefits of being a SportsAid and RBC Athlete. Tim Lawler was asking the questions and he is really good at putting you at ease and so I think I did ok. As well as meeting the RBC riders I also got to meet Olivia Carnagie-Brown which was very very cool. 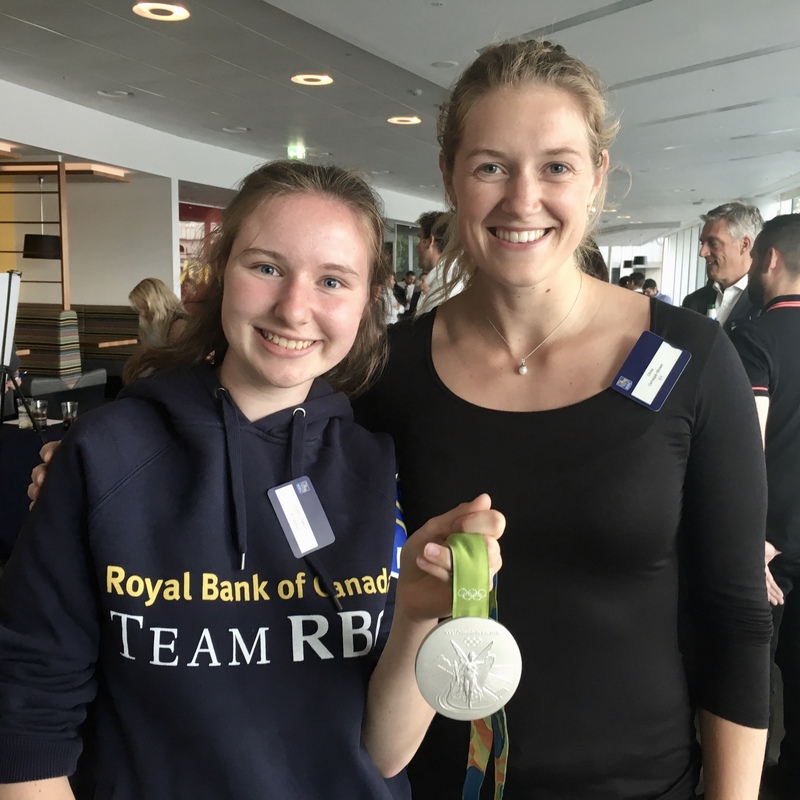 Olivia was sponsored by SportsAid and was part of the Women’s 8 rowing team at the Rio Olympics where she won a silver medal, which she had with her and I got to hold! RideLondon is on the 31st of July I will be on holidays, but I wish all the RBC and SportsAid riders well and I hope they won’t be too sore after 100 miles in the saddle! picture of me back then with my union flag which I still have. I’m a fan of most sports, and it was inspiring to see world class para-athletes from around the world competing at this level. It was an amazing night as Jonnie Peacock was running in the finals of the T44 100M so the stadium was packed and the atmosphere was amazing. We were sat at the front behind the start line, and when Jonnie won gold he came all the way around the track to us on a victory lap, high fived Grace and I got to shake his hand which was so cool. It was an inspiring and brilliant night, we spotted ourselves on TV later and when we posted a picture of it on Facebook the Channel 4 Paralympic team even commented on it! And then of course there was my first ever International representing Great Britain at the CPEDI 2* Competition in Bishop Burton! It was my first experience of being away for a whole five days at competition. Mum helped me get Aslan ready and we set off with Sacha and Emma helping and supporting us too. Bishop Burton is about four and a half hours away by lorry but the traffic was terrible and it tool us over seven hours to get there. Aslan travelled well as usual and we had time for a short session and a bit of a stretch for both of us after the journey before settling in on the Monday evening. The facilities at Bishop Burton are really good and there is plenty of warm up space with two outdoor schools and two indoor as well as the competition arena itself. We rode again on Tuesday before the trot up which Aslan passed with flying colours. Wednesday was our Novice A test and our first test representing Great Britain. Mum and Dad arrived with Grace and my little brother Dylan too, and Aslan’s previous owner Rebecca and her daughters even made the journey to see us compete in an International together for the first time which was really nice. After a good warm up with Sacha we entered the arena for the first time, the bell went and we headed down the centre line to our first halt and salute in an International and it was square! Aslan nailed his first ever mark at International. It was our first experience of riding in front of 5 international judges (yes five!) and the way the Novice tests are scored there is nowhere to hide. Aslan was a star and we rode a good test but one slip and a trip into canter on my left reign (the stronger one grrrrr) lost us crucial points and so we ended up with 62.586% and a fifth place, with a 3* rider taking first place with 65.138% so pretty close stuff. The Novice test is the easiest one we ride, but one slip and it’s pretty much over! Not a personal best but I was glad to get my first test completed with one of the judges giving me 65.517%. 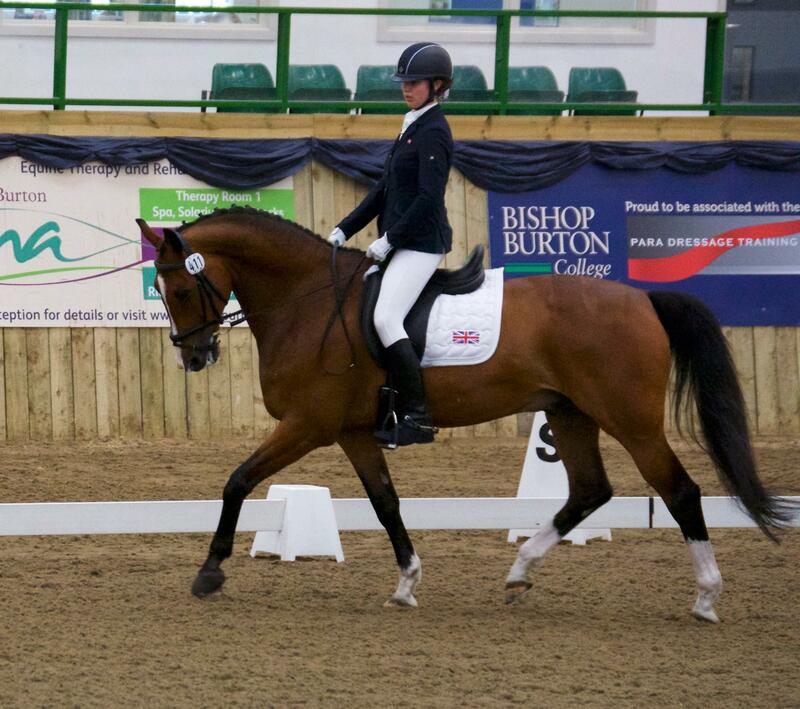 Thursday was our Team Test and a bit of a reality check on just how tough the judging is at CPEDI 2*! The five International Judges for this test were from Sweden Nederland South Africa and two from GBR , and no one from USA who gave us our best score yesterday! We went pretty well but had a slight stumble on our second 10m volte and again on the left shoulder in that follows it (again what should be our better one grrr) so 60.270% overall with one judge giving me 63.5% and another fifth place, only 0.4% being the fourth placed rider and less than 2% behind the third, but quite a bit off the 67% first place, again with the more experienced 3* riders taking the first, second and third. I must admit I was hoping for a better score today but everything went to plan other than the couple of slips, and another test under our belt with feedback to work on and we had qualified for the Freestyle! Friday was the end of a long week of competition, but I was feeling fine and Aslan certainly had plenty of energy. He was stabled under FEI conditions which are tightly controlled but I’m pretty sure he got hold of an extra Weetabix from somewhere! He was raring to go and definitely on a mission, maybe he was inspired by our rousing music or maybe we cantered a bit too much before the bell but either way if Mum had been there she’d have been holding on to her seat in the gallery! It was a bit too energetic for the judges, but we still managed a 61.8% which was an improvement on our Team Test and we had made it through our first FEI International competition representing GBR. It was another fifth place giving me a matching set of rosettes for week and while it was not quire the result I wanted (I prefer winning) I’m not really complaining as it was the most incredible learning experience. 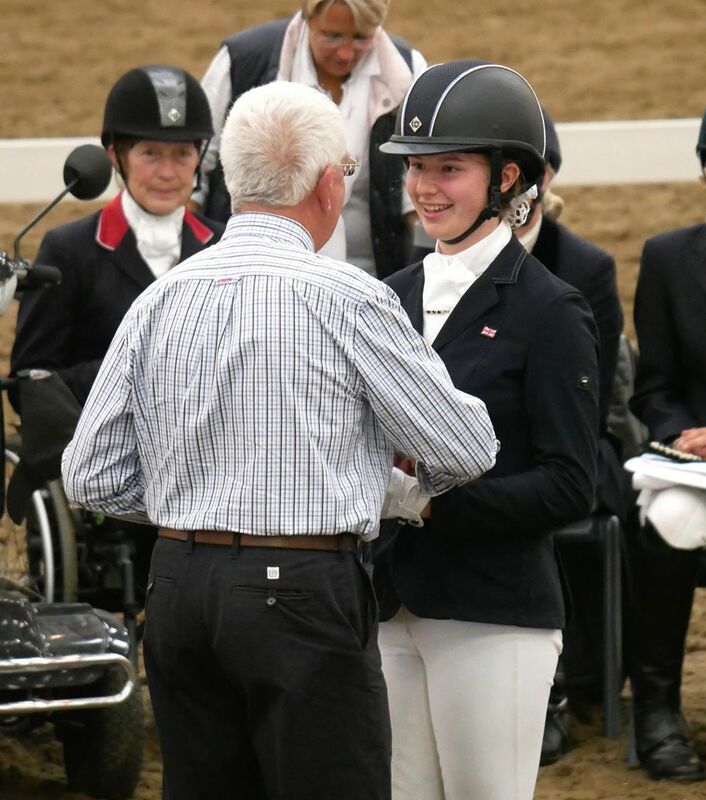 We finished with a nice surprise as right at the end of the prize ceremony I received a training bursary from the Jane Goldsmith Foundation for being one of only two riders under 16 competing at Bishop Burton, and the only under 16 riding in the CPEDI 2* classes. I am very grateful of the award which will allow me and Aslan to have some additional training clinics. This was a timely reminder that I was the youngest here, so fifth in class at my first International was perhaps not too bad after all! I really must say thank you to everyone who supported us and got us to our first International. It was so amazing to ride in the arena to music and a great way to finish the week, so a big thanks to Sarah Morris for providing the music and helping plan the routine (which was awesome if I say so myself). You can see my tests back to back in this video. Finally, while I was away at Bishop Burton I received confirmation that I was had qualified to ride in the Para Summer Festival of Dressage at Solihull Riding Club next month, which is the main Summer National competition at Silver and Bronze levels. It’ll be my first time riding at the competition but I’ll be riding in the Silver category, another new experience as last year I missed out as I had not been riding Aslan long enough to get out to the qualifying competitions, so I am really looking forward to it. My coach Sacha will be away on vacation, so it will be mum and dad as my support team for the first time at a major competition! That will also be the end of the summer season for me, and before the end of August I will already be riding Winter Qualifiers! And that was the end of a very exciting month for me. I’m now off on holidays to France for a couple of weeks, and I will be using some of the time to prepare my application for the 2017-19 British Equestrian Federation Excel Talent Development Squad. When I applied for the last programme I did not have my own horse, and I had not even competed in a British Dressage competition, but here we are two years later having just competed a 2* International. When I get back we’ll be straight into the build up for the Summer Festival of Para Dressage and our first winter qualifier!